President Muhammadu Buhari and his second-in-command, Yemi Osinbajo were quizzed last night on their years in office and what they would do differently if given another four years to steer the ship of the state. This happened at a televised town hall meeting tagged ‘The Candidates’ which took place at Sheraton Hotel in Abuja, courtesy of MacArthur Foundation. The debate began with the President getting the initial questions, but Osinbajo was soon the one doing more of the talking — until the last 15 minutes or thereabouts of the two-hour show when Buhari finally came to life with some witty answers. But, overall, Buhari mostly scratched the surface of the questions, Osinbajo was the one who went in-depth; he was the one re-telling or re-explaining some questions to Buhari; he even answered some on his behalf, eventually prompting the moderator to cut him short at some point. Buhari may be the one manning the last line of this administration, like a goalkeeper, but it was evident yesterday that Osinbajo is the focal point, the striker. Though, as expected, the Vice-President was at his eloquent best, he refused to accept responsibility, on behalf of the current administration, for any problem presently confronting the country. He rather kept laying all the blame for our myriad national problems on the immediate administration from whom they wrested the reins of power. The President cleverly refused to answer a question on ‘selective’ fight of corruption. He rather took a walk down the memory lane mentioning two late people whose lives have no connection with the present. He acted liekwise when asked if he would accept the results should he lose the election. The President had no plausible reasons to give for not prosecuting Babachir Lawal, former Secretary to the Government of the Federation (SGF), who was fired for financial malfeasance. Buhari insisted there was no evidence to nail Babachir. But what manner of evidence could get him removed but did not earn him a reproof? Not once or twice did we see Mr President crane his neck or strain his ears to properly hear what was totally audible to others present at the venue. In fact on a couple of times, the Vice-President had to put his mouth in the President’s ears. Is the President senile? Funnily enough, the first time the hearing problem became obvious was when a question was asked on the disability bill! Talking about primary education and the universal basic education(UBEC) intervention, the President said some governors and local government chairmen are corrupt and press should help in the fight against corruption. Buhari tasked the press people to help fight the Boko Haram insurgency. He wants them to not just do their reports from the cozy ambience of hotels in Maiduguri but take their time to nose around the cauldron of chaos in Monguno or Maiduguri as well. Osinbajo claimed that about 9.2 million school children are fed by the Nigerian Government daily. The effort is to ensure that the school children who are still in their formative years are not malnourished. Meanwhile, according to a report released by the Universal Basic education Commission(UBEC) and supported by the one from United Nations Children Fund (UNICEF), 10.5million — the world highest number — are out of school. One begins to wonder why the government is not investing in efforts to bring these out-school children to school. Mr. Vice-President, in his predictable blame-shifting game, laid the genesis of the country’s economic crisis on the doorstep of the last administration. He said two tranches of money were withdrawn and squandered on election. The First tranche was $292 million and the second one N40 billion. Goodluck Jonathan’s administration was again attacked by the Vice-President. Osinbajo said the Subsidy Reinvestment And EmpowermentnProgramme (SURE-P) was fruitless. He asked: “Who can point to a single beneficiary of the SURE-P programme?”. He claimed their social investment known as N-Power has been more effective in mitigating poverty. According to Mr. Vice-President N10,000 loans have been given to 20,000 petty traders to invest in their businesses and efforts are still ongoing to enhance the scheme. Mr Yemi Osinbajo said the core ideology and principle of the All Progressives Congress (APC) distinguishes it from the Peoples Democratic Party (PDP). He insisted that though politics is an all-comers’ affair, the APC has not compromised its core principle and ideology which, is rescuing the masses from the abyss of poverty. Mr. President believes the Kano State governor could not have been foolish enough to receive a bribe by himself and still be smiling while pocketing the money. He believes the videos might have been doctored using technology. 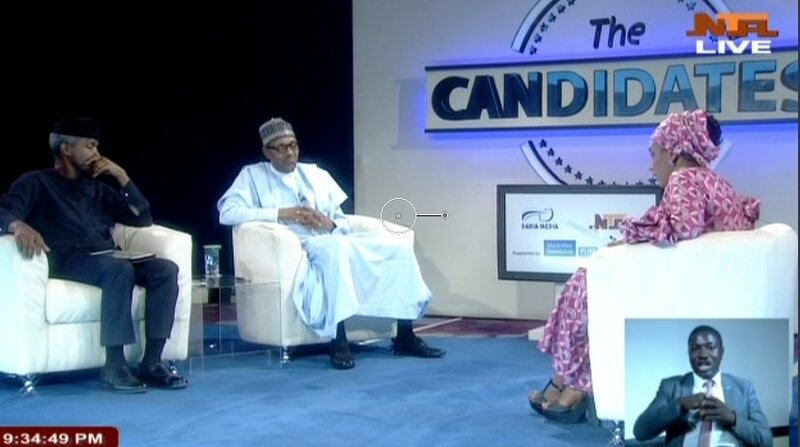 Kadaria Ahmed, the moderator, pleaded with Mr ‘Aaron’ Osinbajo to let Mr ‘Moses’ Buhari talk for himself when asked a question on the Ganduje videos. Osinbajo was not just Buhari’s mouthpiece for most of the night, he was also his ears. He was the puppeteer pulling the strings while Mr President was the docile puppet. Mr. President was asked if he would accept defeat should he lose the election. He said he lost successively in 2003, 2007 and 2011. However, he said losing the election is something close to impossible. Mr President tacitly suggested that he was rigged out of the successive elections he lost until the last administration shot itself in the leg by embracing technology, which did them in. It is left to be known whether the President will take the bold step of signing the electoral bill, too. Insisting he is fit to run despite speculations surrounding his health and his age, he urged people to take a look at the clip of hi campaign in Kogi state. However, there is a short video that has gone viral showing how the resident nearly slipped but for the swift support of his security operatives.